Howdy! My name is Jess and thanks for joining us for this session of Write Right. Today we’re going to discuss dangling and misplaced modifiers. While you may need some brushing up on the definition of these concepts these are actually very common errors in writing that often go unnoticed. These modifiers should be placed as close as possible to the word or phrase they’re modifying to avoid confusion. When either awkwardly situated within or added without a clear subject to a sentence, a modifier can be considered misplaced or dangling. First we’ll discuss misplaced modifiers. A misplaced modifier is a modifier placed awkwardly within a sentence so the reader is unclear as to what the phrase is describing. “When thick and greasy, my aunt loves pizza rolls.” In this sentence the phrase, ‘when thick and greasy’ is misplaced. The reader is left wondering what is thick and greasy, the pizza rolls, or your aunt? In this example the adverb ‘nearly’ is misplaced. Did the subject eat almost all of the cookies in the box or did the subject nearly start snacking but never actually eat anything? While most people would understand what you mean, the entire meaning of this sentence changes with adverb being placed directly before the verb. “Covered with hot melted cheese, we ate the pizza.” So wait, was the pizza covered in hot cheese, or were you? And lastly: “The hunter crouched behind a tree waiting for a bear to come along with a bow and arrow.” Was the hunter crouched down holding a bow and arrow, or was he waiting for an armed bear to come along in the forest? Luckily misplaced modifiers can be easily solved, by simply moving the modifier closer to the word you are describing. Next, we’ll discuss the second category, dangling modifiers. A dangling modifier is a word or phrase that modifies a word not clearly stated in the sentence. These phrases are often found at the beginning of a sentence and are simply left dangling with no subject to modify. In this sentence there is no subject for the opening phrase. “Raised in Texas describes an unknown subject, while “it is natural to like barbeque” is a complete that could stand alone. In this second example, “although nearly finished” is closest to “we” but seems to be describing the movie. Regardless, there is no subject given for the opening phrase and the second half of the example, again, is a complete sentence that could stand alone. “Flying over the African landscape, the elephant heard looked magnificent.” Who is flying over the African landscape? Yourself in a helicopter? Or an entire elephant heard like Dumbo with his ears. 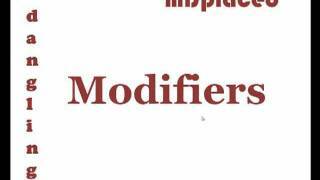 There are several strategies you can employ to easily remedy dangling modifiers. First, you can name the appropriate or the logical doer of the action as the subject of the main clause. “Raised in Texas, I naturally like barbeque.” Now the reader knows that you were raised in Texas and therefore, naturally like barbeque. Secondly, you can change the opening phrase that dangles and do a complete introductory clause by naming the doer of the action in that clause. “Although the movie was nearly finished, we left early because our mom called.” It’s now clear who or what was nearly finished—the movie. And finally you can simply combine the dangling phrase and main clause into one complete sentence. By adding the subject ‘we’ to specify who was flying and moving the phrase to the end of the sentence the reader can easily discern which subject was completing what action. Well that wraps up our podcast on misplace and dangling modifiers. Thanks again for joining us on Write Right and tune into our other podcasts to help with other common grammar mistakes.